A sanctum of relief from grey late-Autumn London skies, The Agency’s new solo exhibition by Brazilian-born artist Eduardo Padilha is full of colour, and the warmth that comes from food-for-thought. 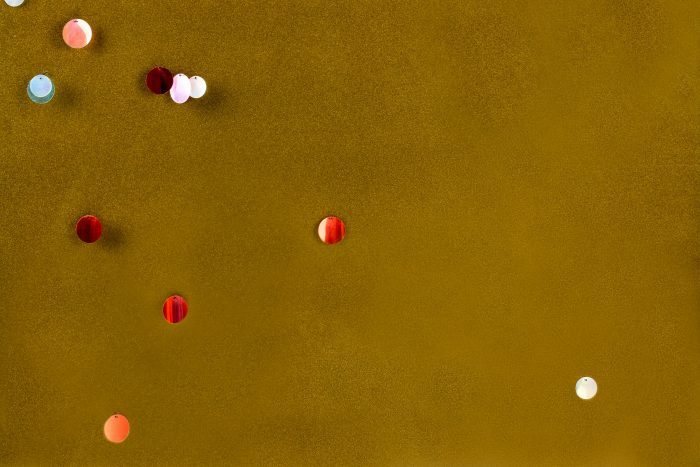 Orbits, from which this exhibition takes its title, are a series of exquisite ephemeral sequins held loosely in dense wood panels with small panel pins. 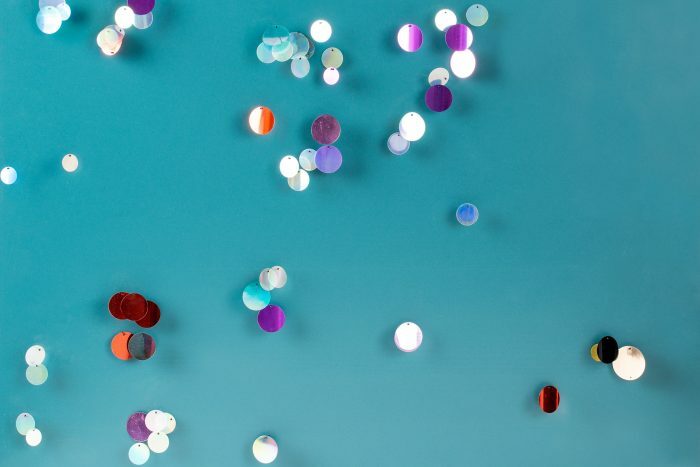 The effect of their scintillation, as they seem to almost drip from their shiny surfaces, is a play on pixelation, becoming a metaphor for contemporary abstraction. It’s a tiny, beautiful detail, but it opens up a whole dialogue between utilitarian and non-utilitarian discourses, with the subtle suggestion in its hang between interior décor and museum piece. In the middle of Gallery 1 is a sculptural piece built upon on the metallic structures of a number of ‘Butterfly’ chairs, ubiquitous design classics from 1938. 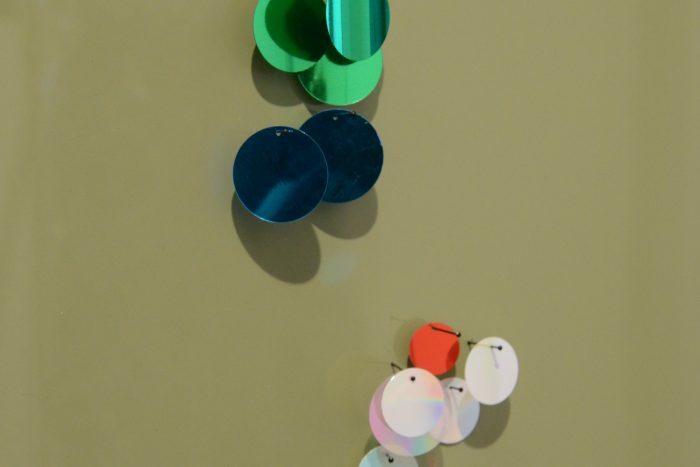 This idea of constructing by deconstructing construction is one that is undoubtedly on the minds of many contemporary visual artists and musicians — and moves the conversation of Orbits from the eponymous wall pieces into a more practical line of thinking, bringing in questions of originality, recycling, and resources. This is Eduardo Padilha’s ‘remix’ of the Argentinian ‘Gruppo Astal’ designer Jose Ferrari Hardoy. But it also charts a personal, autobiographical interest in the expression of modernity. Memory, for Padilha, is modernity – and it is comforting, rather than frustrating. This leads on to two photographic pieces, using found and crafted images that continue the notion of layering, collage and a play on contemporary abstraction. Vintage photographs of gamine Brazilian footballers are layered with acetate, so that they assemble into a kind of conceptual wall pattern; alongside are hyper-exposed close-ups of ubiquitous garden roses, which become components of an assemblage themselves, with delicate, subtle shifts of colour. Orbits reinforces The Agency’s place as one of the most pioneering galleries of contemporary art in London. Bea De Souza, its director, runs the gallery more like a Punk producer in the halcyon days, intelligently and obsessively introducing seditious artistic talent, inside a residential house on what is otherwise possibly one of the bleakest roads in South London. One can only admire her for bringing unflinchingly high art into such an area, and with such a devil-may-care attitude. But then – creating frisson is exactly what De Souza does best.